What better way to celebrate International Women’s Day than with a film about the future queen of England and her sister defying social expectations to sneak out of Buckingham Palace to party with the locals during the VE-Day celebrations. Yass Queen. 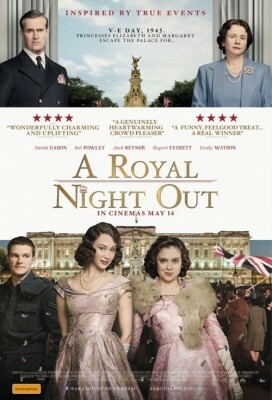 A Royal Night Out is a “what if?” film, set in 1945 on the day British Prime Minister Winston Churchill announced the end of the Second World War. Supposedly, a young Princess Elizabeth and Princess Margaret were allowed out of the palace to join the celebrations. The film speculates at what may have happened that night, and of course, chaos and shenanigans ensue. The sensible, demure Elizabeth is played by Sarah Gadon, in stark contrast to the bumbling, adventurous Margaret, played by Bel Powley. While the girls came off as caricatures of the real princesses, with the young Elizabeth in no way matching up with the image of the real-life monarch, it fit the charming, bubbly and light-hearted tone of the film. While director Julian Jarrold didn’t seem overly bothered with accurately documenting the historic day, the film takes you on an adventure filled with pale pink chiffon evening gowns, lindy hop and British humour, with, of course, the appearance of a dashing Royal Air Force pilot (played by Jack Reynor) to add the teensiest hint of romance to the plot. A Royal Night Out is not to be taken seriously, however it is a charming film with a few laughs that will leave you wanting to take up lindy hop classes.